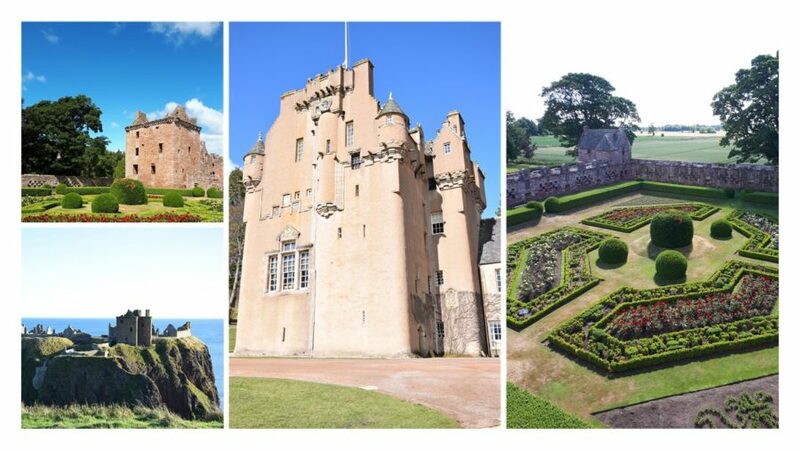 The Aberdeenshire Castle Tour will show you some of the regions most popular castles. This is only a small selection, as there are a great number to choose from but we think these are of the best. We will have the opportunity to visit: Dunnottar Castle, Edzell Castle and Crathes Castle. Dunnottar Castle is a dramatic and evocative ruined cliff top fortress which was the home of the Earls Marischal, once one of the most powerful families in Scotland. Edzell Castle gives you a sense of the standing of the Lindsay family from the beauty of their lordly seat. Its highlight is the great garden added in 1604, which has enclosing walls featuring decoration unique in Britain. Finally Crathes Castle, standing against a backdrop of rolling hills and set within its own glorious gardens, Crathes Castle is every inch the classic Scottish tower house. We will stop for lunch at one of the area's local restaurants/cafes for a taste of local cuisine. The tour does not include entry to the castles which are: Dunnottar £7.00, Edzell £6.00 and Crathes £13.00. Lunch is on average £15.00 per person. There will be several photo opportunities during the tour. There is a lot of walking and many stairs on this tour. To book the Castles tour check the calendar below for availability or browse our other full day tours.